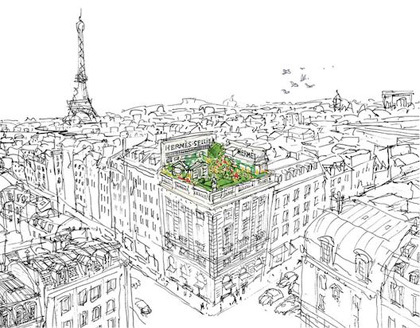 Hermes' HQ, at 24 Rue Faubourg Saint-Honore, is also home to one of the most luxuriant roof terraces in the city. A secret garden hidden in the heart of Paris. It's all so romantic it kills me. 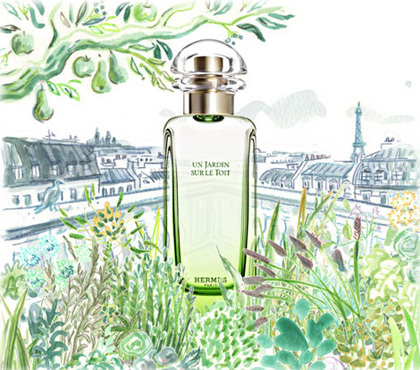 Un Jardin Sur Le Toit (A Garden on the Roof) is the latest in the sublime Jardin Collection of fragrances from the French doyennes of luxury. "The garden is full of aromatic herbs, flowers and fruits whose flavors vary as they pass through the seasons. Its fresh, sweet-smelling atmosphere is captured by apple, pear, rose, green grass, basil and magnolia." Frankly, I'm hooked.